The charrette team, led by Mike Kros of DLR Group, focused on developing a unified program for improving the quality of life for the Drake Court Neighborhood on the southwest edge of downtown Omaha, strengthening the physical, human, social, economic, and environmental capital and creating a safe place for neighbors and visitors. You can download a PDF copy of the Drake Court Charrette Final Report here. The perception of safety is one of the greatest challenges to the neighborhood. Crime, drugs, transients, poor and dilapidated buildings were all cited as reasons the area is considered unsafe. In addition, a large Douglas County corrections facility is located three blocks to the east, adding to the perception of a crime. The overall transient feel of the area also contributes to this perception. Absentee landlords, lack of property reinvestment and one-way streets have all created a “drive-through” neighborhood rather than a destination. Fortunately, there is also much to build upon in the area, and considerable progress has been made in rehabilitating the Drake Court Apartments and in boosting public interest in further improving the area. Assets to the neighborhood include Liberty Elementary School, the Omaha Children’s Museum, The Rose Theatre, and a YMCA. Strong multi-family development in the Drake Court complex and its proximity to downtown make it an ideal location for a number of pedestrian activities. In addition to nearby art-based programs, the area has interesting architectural details and human scale. There are a number of possible sites for redevelopment that could leverage private sector involvement and encourage participation of the nearby school. The redevelopment of the Drake Court Apartments, facilitated by the Joslyn Castle Institute for Sustainable Communities, is an important catalyst for inspiring new enterprise in the neighborhood. 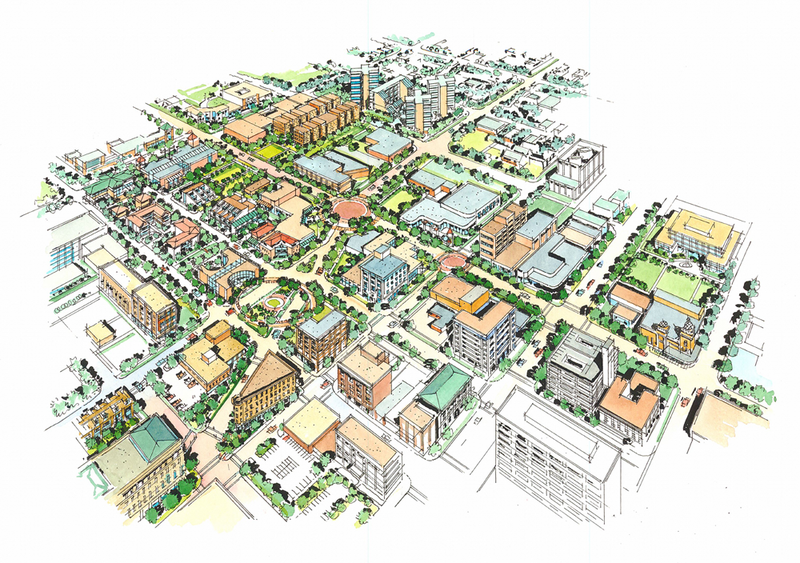 The charrette team examined elements that comprise a walkable street environment, including the perception of safety, adequate lighting, good sidewalks, green spaces and natural landscaping, public art, and attention to historic preservation and human scale. The team also noted earlier studies that identified the 20th and Howard Street intersection as a central point that could provide many opportunities for business, community, and private endeavors. Strengthen the character of buildings and other spaces and emphasize pedestrian scale. Plant street trees and address vacant lots. Identify and demolish dilapidated structures. Create public green spaces with linkages between the neighborhood and downtown along streets or enhanced alleyways. Improve access to transportation services (bus, shuttle) and enhance pedestrian transit (walking, biking). The team noted that improvements should first enhance the quality of life for existing residents, and that any redevelopment should minimize gentrification of the neighborhood and not displace residents. It is critical to identify and develop local leadership and encourage both parent and student education initiatives. Neighborhood identity—a sense of place—is critical to instilling community pride and a feeling of ownership. Being a very diverse neighborhood, it is important to provide amenities that community members can strongly identify with. The neighborhood is not Midtown, or Downtown, or South Omaha. What is it then? In more concrete matters, the team suggested that one-way streets (Leavenworth, St. Mary’s, Harney, Farnum, 20th, 22nd) be returned to two-way to improve pedestrian safety and enhance street level, mixed-use retail. Other suggested enhancements include wider sidewalks, new land- and streetscaping, on-street parking (diagonal and parallel). New lighting should be similar throughout the community, providing a sense of safety and community identity. Daily services such as a drug store, medical clinic, and grocery store should also be attracted and retained along with existing businesses to enhance pedestrian opportunities for neighborhood residents. The team proposed greenspace opportunities such as a parking garage with a rooftop garden and the development of a community garden. By increasing green spaces and walkable corridors, the perception of safety will dramatically increase. In addition, inventing new avenues for restaurants, cafes, and retail and strengthening existing business will encourage residents and visitors to spend more time in the area and enliven public spaces. In seeking incentives for change, the team stressed policies that encourage owner-occupied housing units, improve policing of the area, strengthen communication between residents and city, and lead to the development and adoption of a neighborhood master plan.